Sgt. 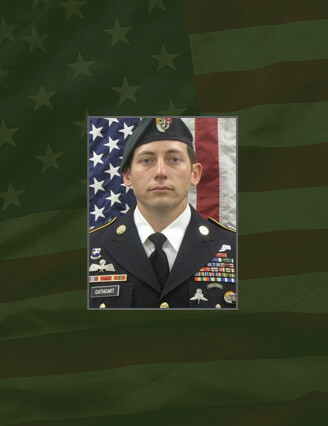 1st Class Michael A. Cathcart, 31, of Bay City, Mich. died Nov. 14, 2014 of injuries sustained during combat operations in Kunduz Province, Afghanistan. Cathcart was assigned to Company A, 3rd Battalion, 3rd Special Forces Group (Airborne), Fort Bragg, N.C., and was deployed in support of Operation Enduring Freedom. This was Cathcart’s fifth deployment with the battalion, known as Bushmen, to Afghanistan. Cathcart enlisted in the Army in June 2001 as a fire support specialist. Upon completion of Army Basic Combat and Advanced Individual Training, he reported to the 101st Airborne Division (Air Assault) where he served for more than five years. His tenure at Fort Campbell included two combat tours to Iraq in 2003 and 2005 in support of Operation Iraqi Freedom. Cathcart volunteered for Special Forces in 2007. After completing Special Forces training, Cathcart was assigned to 3rd Bn., 3rd SFG (A) in September of 2009 as a senior engineer sergeant. Cathcart’s awards and decorations include three Bronze Star Medals, the Purple Heart Medal, four Army Commendation Medals, two Army Achievement Medals, Army Good Conduct Medal (fourth award), and the National Defense Service Medal, the Afghanistan Campaign Medal with two campaign stars, the Iraq Campaign Medal with one star, Global War on Terrorism Service Medal, Noncommissioned Officer Professional Development Ribbon (numeral 2), Army Service Ribbon, the Overseas Service Ribbon, the NATO Medal, the Military Free Fall Jumpmaster Badge, the Parachutist Badge, the Air Assault Badge, the Combat Infantryman Badge, and the Special Forces Tab. Cathcart was posthumously awarded his fourth Bronze Star Medal and the Meritorious Service Medal.